on the night of June 24, 1953. 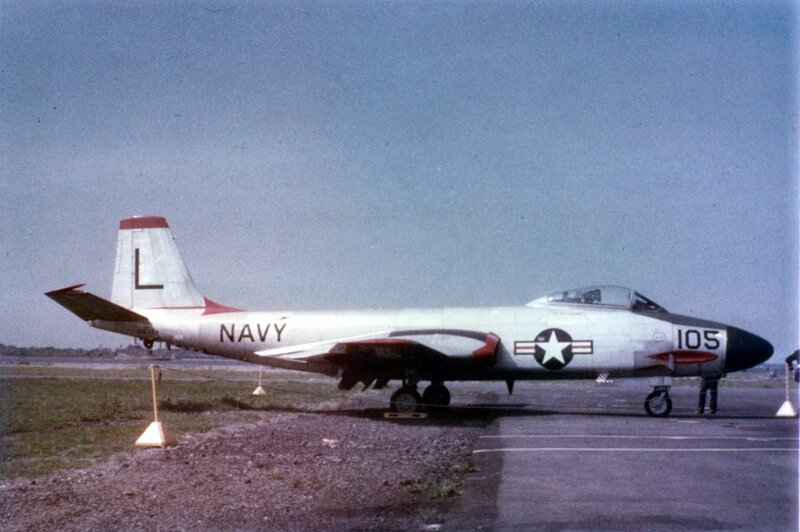 On June 24, 1953, a flight of U.S. Navy F2H Banshee jets out of Quonset Point Naval Air Station were on a night training mission over southern Rhode Island when two aircraft in the formation collided in mid-air. The resulting flash and explosion was seen for miles by those on the ground. The crash occurred at 19,000 feet near (over) the Exeter/West Greenwich town lines, and debris was scattered for several miles in all directions, most of it coming down in woodlands, but some of it on public roadways. A large portion of one Banshee, (Bu. No. 126384) piloted by Lt. Jg. Jack Oliver Snipes, 24, came down in Robin Hollow Pond, off Robin Hollow Road, in West Greenwich. It was later recovered by the navy. It is believed Lt. Snipes was killed instantly in the collision. The nose portion of the his aircraft up to the cockpit was torn away by the impact, and Snipes fell away still strapped to his ejection seat. His body was later recovered still in the seat in a wooded area off Breakheart Hill Road in West Greenwich. The main portion of the other Banshee, (Bu. No. 126411) piloted by Lt. Jg. James J. Schollian, 23, came down in an area off Austin Farm Road in the town of Exeter. Schollian was able to successfully eject from his aircraft, and parachuted safely. At the moment of impact Lieutenant Schollian’s cockpit was illuminated by the intense light of the explosion, and his aircraft was set ablaze. As Snipes’ plane spun away in a flat spin, Schollian attempted to bail out, but discovered his ejection seat was not working. Remembering his training, he released his seatbelt and literally floated up and out of his seat, then pushed himself out of the falling jet with his feet. It took him several more seconds to locate the parachute D-ring, but he finally deployed the chute at about 10,000 feet. Hanging in the air, he watched his doomed aircraft continue on its fiery plunge to oblivion. As he got closer to the ground he saw two cars stopped by the side of a road, and lit a signal flare, but it failed to gain any attention. Prevailing winds carried him over heavy woodlands where he came crashing down through the treetops. After assessing himself for injuries, he set out to find a road, but the woods were near pitch-dark, and he didn’t have a compass. After stumbling around in the dark for awhile he came to a clearing next to a swamp and decided to light a signal fire. After awhile a circling aircraft spotted the fire and led him out of the woods where he was found about three miles west of Nooseneck Hill Road, West Greenwich. The flash of the mid-air collision was seen by those in the air-traffic control tower at the Quonset Naval Air Station, and within seconds their worst fears were confirmed as the flight leader contacted the tower. As crash-rescue personnel were mobilized, hundreds of civilian curiosity seekers converged on the area clogging the roadways which hindered fire fighters battling numerous brush fires started by the falling debris, and search and rescue operations being conducted by the navy. State and local police did their best to block access to the area, but the throngs of humanity were no match for the comparatively small contingent of law enforcement. The dark night and poor visibility hampered search teams, and authorities had to deal with conflicting reports based on rumor and vague witness accounts. It is therefore understandable why the following morning local newspapers erroneously reported that both pilots had been found, and that only one had suffered any injury. Unfortunately this was untrue. While at the time the papers went to press Lieutenant Schollian had been located by searchers, Lieutenant Snipes was still missing. As the sun came up on the morning of the 25th, a contingent of aircraft took off from Quonset NAS to conduct an aerial search of the vast wooded areas of Exeter and West Greenwich. The search was partially delayed when one of the search aircraft developed engine trouble shortly after take-off and went down in Wickford Harbor. Fortunately the crew escaped without serious injury, but some of the resources allocated to looking for Lieutenant Snipes had to be diverted to Wickford. The body of Lieutenant Snipes was recovered on the morning of the 26th. A memorial service for him was held the following Monday at the Quonset Chapel, and was attended by his squadron mates. Jack Oliver Snipes was born October 1, 1928 in Greensboro, North Carolina, to Ransom Oliver, and Maude Elizabeth Snipes. The family later moved to Nashville, Tennessee, where Jack attended local schools. He attended North High School in Nashville from 1945-46, before transferring to East High School, also in Nashville. Jack left high school during his senior year, and enlisted in the United States Navy on February 18, 1947. 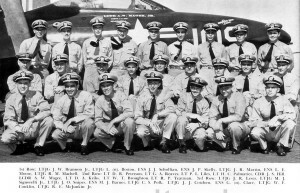 After basic training in San Diego, California, he was sent to Aviation Fundamental School in in Jacksonville Florida, then on to Aviation/Aerial Photography School in Pensacola, Florida. From there he was assigned to Utility Squadron 10, (VU-10), stationed at Guantanamo Bay, Cuba, as a photographer. While in the navy, Jack completed his high school studies and received his GED from East High School in 1948. He later applied for and was accepted to pilot training school. He began flight training on January 26, 1949 at the Pensacola Naval Air Station in Florida, and did extremely well. After Pensacola, he was sent for advanced training at the naval air station in Corpus Christi, Texas, where he was stationed from March thru September of 1950. On September 20, 1950, he received his officer’s commission as an Ensign in the United States Naval Reserve, as well as his navy pilot’s wings. After being sent to Whiting Field in Florida for more advanced training, Ensign Snipes was assigned to Fighter Squadron 71, (VF-71), and transferred to Quonset Point, R.I., where he reported for duty on November 18, 1950. 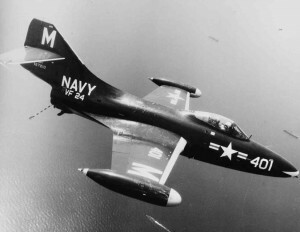 In January of 1952, VF-71 was assigned to Carrier Group Seven, Atlantic Fleet, to conduct test flights of the Navy’s new F9F-5 Grumman Panther fighter jets equipped with various experimental engines to determine how the different engines would affect the operational performance of the aircraft in simulated combat conditions. One can see the potential hazards connected with such an assignment. Testing took place 24/7 under any and all types of weather conditions, because the information to be learned was considered vitally important to the on-going war effort in Korea. This testing period continued until March 1, 1952. On May 14, 1952, VF-71 was transferred to the aircraft carrier Bon Homme Richard, (CV-31). During this time period the squadron was flying F9F Panther jets. The Bon Homme Richard sailed into the Korean Theatre of Operations on June 22, 1952. 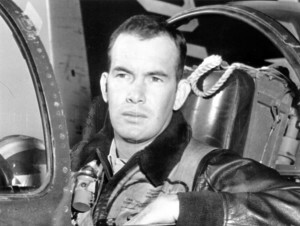 The following day Ensign Snipes participated in a coordinated air strike on a hydro-electric complex in North Korea for which he was later awarded the Air Medal with gold Combat Star. Between September 22, 1952, and December 12, 1952, Ensign Snipes flew twenty combat missions over North Korea. According to fitness evaluations in Ensign Snipes’ navy personnel file, he was considered an excellent pilot and showed great leadership capabilities. 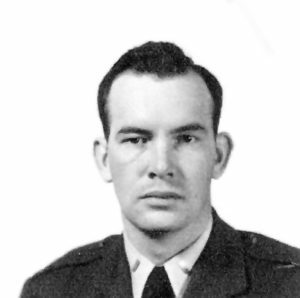 He was promoted to Lieutenant Junior Grade on October 17, 1952. Lieutenant (Jg.) James Schollian continued to serve in the Navy until his retirement in 1976 at the rank of captain. Lt. Jg. Snipes standing third from left, back row. Lt. Jg. Schollian third from left, front row. The F2H-3 Banshee was a Cold War era, single-seat fighter jet, designed by the McDonnell Aircraft Corporation for the United States Navy. It was a large, well-armed, aircraft, measuring 44’, 10” in length, and 40’, 2” wide, capable of sailing through the sky at over 500 mph. When fully loaded, it carried slightly more than eleven-hundred gallons of high octane aviation fuel, which could explain the massive fireball created when the collision occurred. The word Banshee comes from Irish and Scottish folklore, and refers to a female spirit who is a harbinger of death. It is said that banshees can attach themselves to a particular family, and when a member of that clan is about to die, the banshee will begin a melodic sorrowful moan foretelling the impending death. at the Quonset Air Museum. 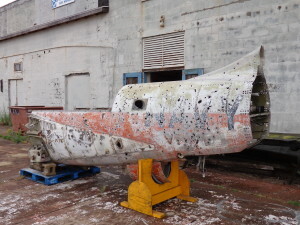 In 2011, the Quonset Air Museum of Rhode Island acquired an F2H-3 Banshee in need of restoration. 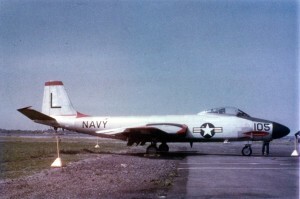 Restoration was begun, and plans were underway to give it the same paint scheme and markings as the one flown by Lieutenant Snipes as a memorial to him. Unfortunately, in March of 2015 a portion of the museum’s roof collapsed under the weight of heavy snow, and the building was closed to the public. Then, for a variety of reasons, the museum was forced to permanently close in 2017. Thus the project was never completed. 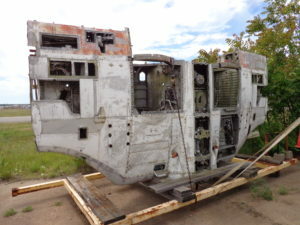 Update, October, 2017: The Quonset Air Museum Banshee has since been sold to a private individual who had the pieces transported to his property where he plans to continue the restoration. The accident scattered debris from both aircraft over a wide area, and due to the rural nature of the towns of Exeter and West Greenwich, some of it was never recovered by the navy. Over the years pieces have been found in the woods by hunters, hikers, and metal scrapers. A center-wing portion of the Quonset Air Museum F2H Banshee under restoration. Now in the possession of a private individual. According to a Providence Journal article dated 6-26-53, Navy crews buried the wreckage of Lieutenant Schollian’s Banshee “off Victory Highway where it fell to earth.” It presumably lies there yet, waiting for the day when future development might bring it to light. Those who find it may wonder how it came to be there. Hopefully they will know of this story. Providence Journal, ”Searchers Fail To Find Trace of Missing Banshee Jet Pilot”, June 26, 1953. Providence Journal, “Body Of Missing Jet Pilot Found”, June 27, 1953. The Meridian Record Journal, “Pilot Hunted After Two Jets Crash In Air”, June 26, 1953. Book, United States Navy Aircraft Since 1911, by Gordon Swanborough & Peter M. Bowers, Funk & Wagnalls, 1968. Information supplied by Lawrence Webster, Aviation Archeologist & Historian. June, 2017 – Copy of Lt. Jg. Snipes’ navy personnel record.